Easily convert DRM protected music and various audio files to unprotected MP3, MPEG4, CD, iPod and other MP3 player file formats at high speed and in CD quality. Legally. With just a few mouse clicks you can enjoy all your protected songs on iPod, iPad, any other MP3 player, CD player, cell phone or PC - without any restrictions or DRM protection. Extremely fast, really easy to use and install even for non-technician person. SoundTaxi is an all-in-one software to convert almost any audio and video files, both protected and non-protected, to commonly used formats such as WAV, MP3, MPEG4, DivX video. You can run SoundTaxi CD Ripper by clicking on "SoundTaxi CDRipper" shortcut from SoundTaxi program group. 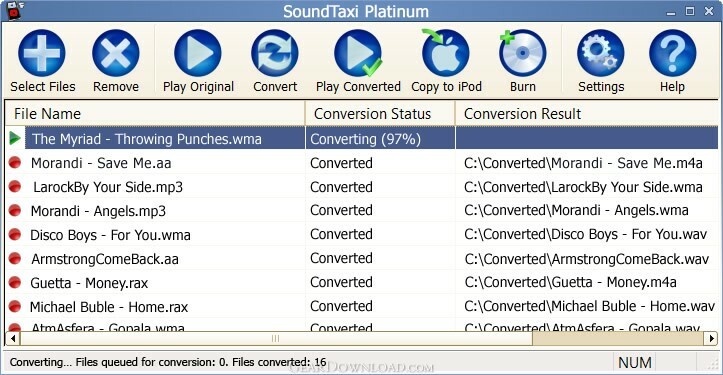 SoundTaxi CD Ripper rips CD to your desired format. It retrieves the CD information such as artist name, album name, track names etc from Internet if available. SoundTaxi also adds a "Rip YouTube File" button on Internet Explorer toolbar. If you open a webpage that contains YouTube movie and you want to download it, just click the "Rip YouTube File" button. SoundTaxi will start to download the video file and save it to the temporary folder. After that SoundTaxi will start automatically to convert and save the video to your PC. The trial version of SoundTaxi limits output audio files to 30 seconds duration and video files to 3 minutes. Registration is highly recommended. This download (SoundTaxi_4.3.8-Setup.exe) was tested thoroughly and was found 100% clean. Click "Report Spyware" link on the top if you found this software contains any form of malware, including but not limited to: spyware, viruses, trojans and backdoors. DRM Converter 4.3.8 - Convert DRM protected and non-protected audio. AudioAlchemy WMA Edition 2.3 - Fast, easy-to-use, configurable conversion from nearly all audio formats to WMA. 4Musics OGG Bitrate Changer 4.1 - Change bitrate of OGG files in one click at high speed and quality! Fast Audio Converter 2.5 - Fast Audio Converter - a supreme converter for the popular audio, video formats. WFilter Enterprise 4.1.168 - Monitor Internet activities and manage Internet behaviors. 4Musics WAV Bitrate Changer 4.1 - Change bitrate of WAV files in one click at high speed and quality! Road Rush 1.6.0 - Road Rush - a thrilling racing arcade! GraFX Saver Pro 4.01 - Create and distribute screen savers using images, video, audio, and effects!